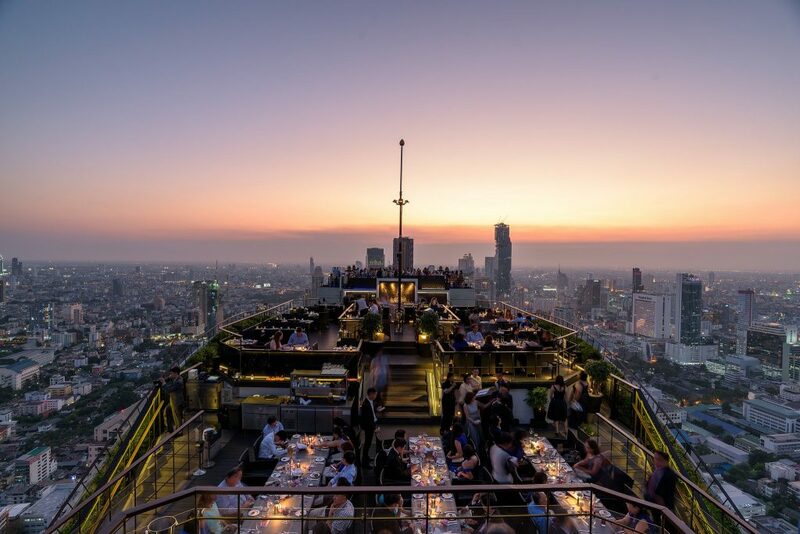 Bangkok’s heat can be unbearable, but these cool bars and restaurants make sitting in the capital’s heat well worth it. 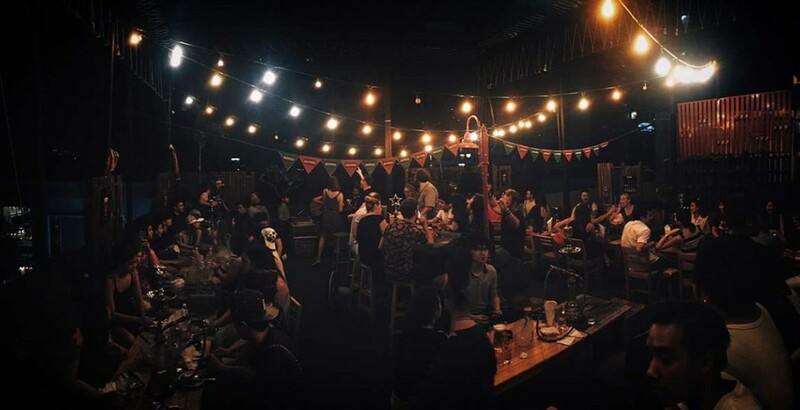 Here are the top bars with the best outdoor seating in Bangkok. When a venue has a rooftop bar, you might be under the impression that you must be dressed to the nines. This is not the case at Wanderlust Rooftop Bar. 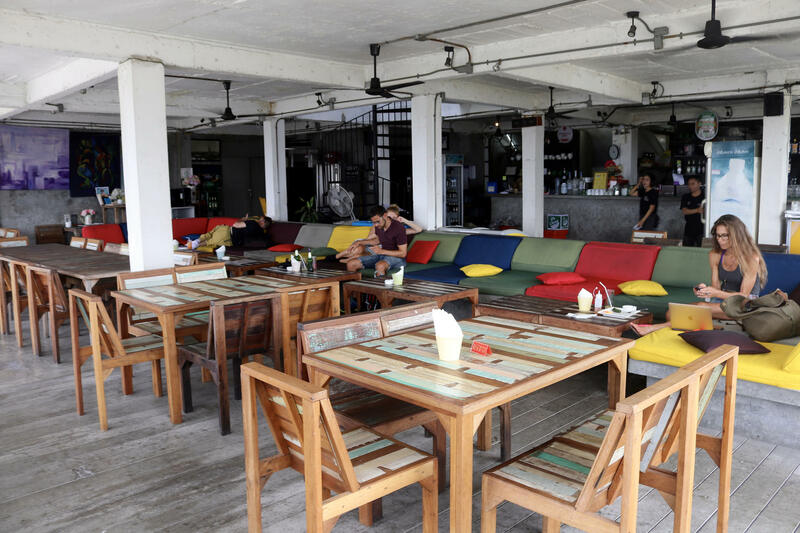 This chilled out bar is located in Thonglor off a relatively quiet side alley. The rooftop is decorated to resemble a garden of sorts, with faux grass and foliage around the exterior. The views are certainly nothing like those of the tall and towering rooftop bars around the city, but its the vibe here that keeps people coming back for more. The wooden furniture in combination with the hanging lights make for a romantic ambiance, and the bar is small and intimate. These vibes are best enjoyed with one of Wanderlust Rooftop Bar’s cocktails or signature Thai dishes. Visitors will find River Vibe Restaurant and Bar in the historic neighborhood of Talad Noi in Chinatown. It is sequestered along a quiet soi (street), only giving away its seemingly concealed location with a handful of signs found in the area. Arrows point visitors in the right direction so that they may enjoy River Vibe’s outdoor seating area. The restaurant and bar sit some eight stories up right along the banks of the Chao Phraya River. Wat Arun and its towering stupas can be seen in the distance, along with a few other noteworthy attractions in the area. Visitors can enjoy these views as they dine on delicious Thai and international cuisine. 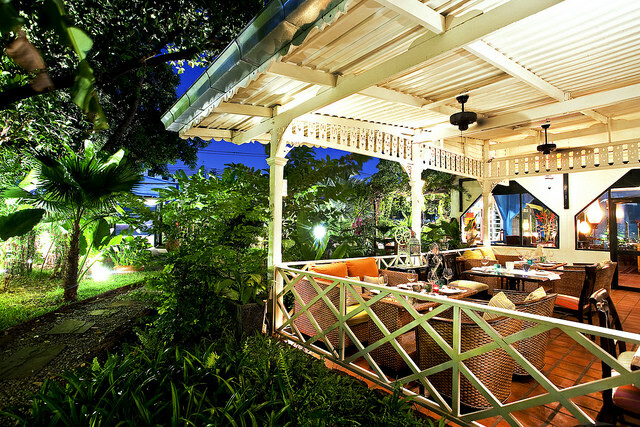 River Vibe is also a guesthouse, should diners wish to prolong their stay at this quaint, outdoor eatery. The Bangkok Tree House is one of the only accommodation options visitors have if they truly want to escape Bangkok’s urban decor. Those unwilling to sleep amongst the trees, however, may opt to at least dine amongst them. 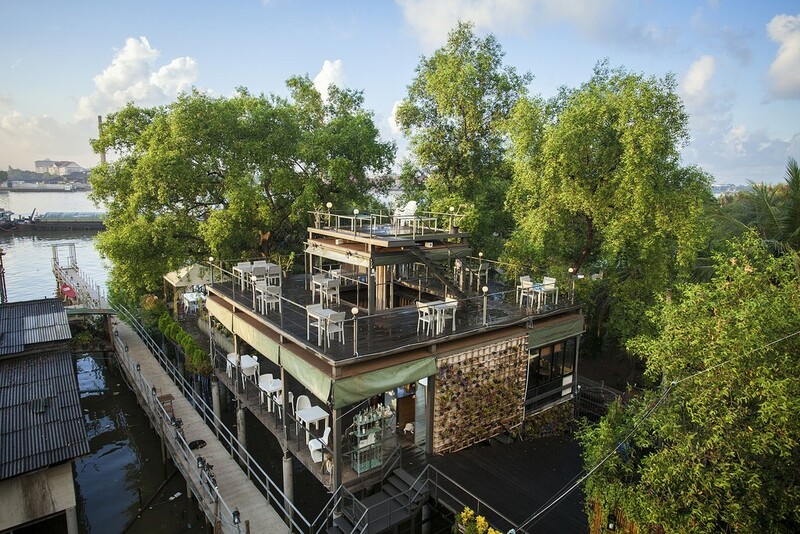 Reflect Restaurant at the Bangkok Tree House is surrounded by picturesque scenery on all sides. From the cycling trails that wind through the island of Bang Krachao, where this hotel and restaurant are located, to the banks of the Chao Phraya River, there are certainly no shortage of views. The majority of the seating is outdoors, but covered and equipped with plenty of shade. This restaurant is all about sustainability, utilizing their own farms and gardens to make both delicious Thai and international dishes. Most dishes can be made vegan upon request, as well. With so many bars and restaurants lining the Chao Phraya River, choosing just one to dine at can certainly be a daunting task. Here making that choice much easier is The Deck by Arun Residence. Views do not get much better than those found at this delicious eatery. There are three floors to choose from: the first and second are serving up delicious Thai and international cuisine while the third (Amorosa Bar) acts as a light snack and cocktail lounge. 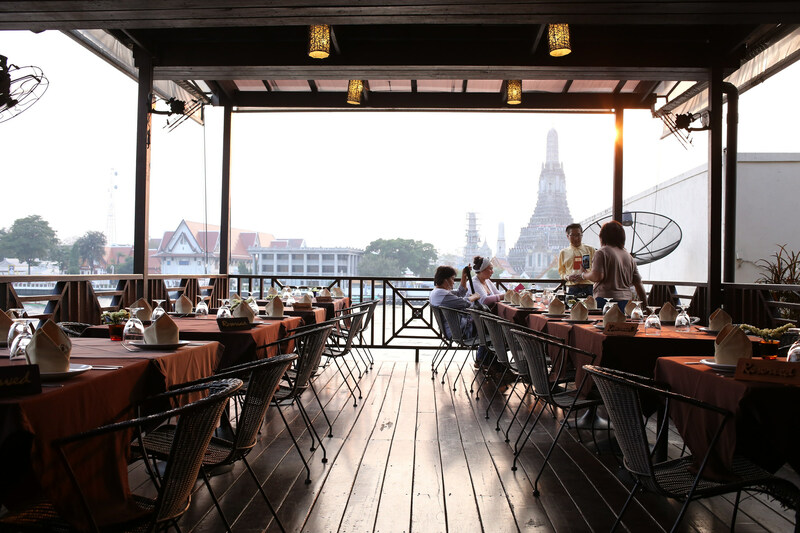 Whatever floors diners choose, they will rest assured that the views of the majestic Wat Arun that sits just across the river are worthy. The Gardens of Dinsor Palace is another restaurant that will make diners feel as though they have left the busy capital behind them. There is no better way to enjoy brunch than in the al fresco area of this double-story colonial palace. The palace was built in the 1930s, and its original purpose was to be a royal residence for the daughter of Prince Bhanurangsi Savangwongse. Because of its royal guests, no detail was left behind when designing this now romantic restaurant, including the surrounding lush foliage that shades the outdoor seating area. The outdoor dining area can hold up to 300 people, as well. Located on the 33rd floor of the Fraser Suites Sukhumvit is Above Eleven. There are two outdoor, yet covered, seating areas to choose from, both which offer diners spectacular views of the capital. Be sure to check out its unique décor while dining, which is made to resemble Central Park in New York City. While its outdoor dining area is certainly Instagram-worthy, be sure to use the restroom here at least one: you will see what we mean when you go to the loo. Though located a bit outside of the city center, Chocolate Ville and its massive outdoor seating area are certainly worth the trek. The themed restaurant feels as though it was plucked out of a quaint, European village and struck on the outskirts of Bangkok. Hundreds of outdoor seats are available, all of which offer great views of the charming décor found throughout. 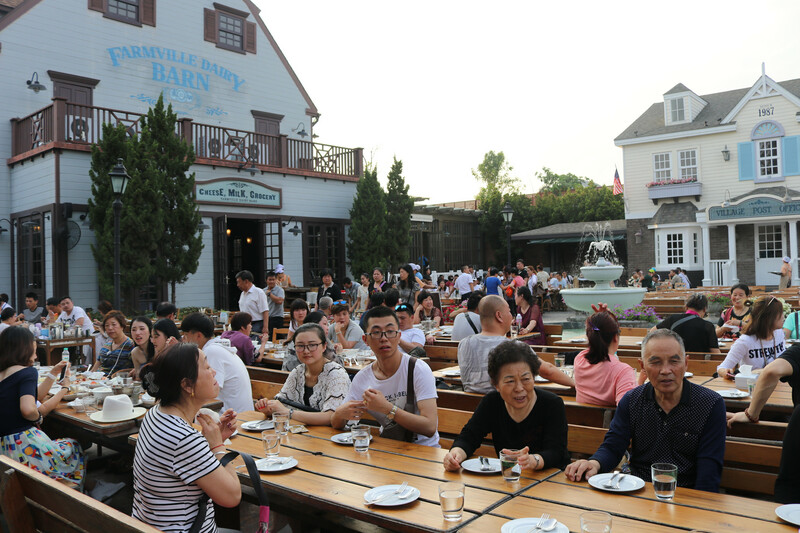 Visitors can choose to dine family-style at one of the large, wooden tables sitting adjacent to the restaurant’s winding waterways. There are also high-topped tables for two should diners want a more romantic meal. The 100-year-old Thai villa that Issaya Siamese Club sits inside certainly makes for a romantic atmosphere. Just outside of these doors, however, is the even more charming, outdoor seating area. 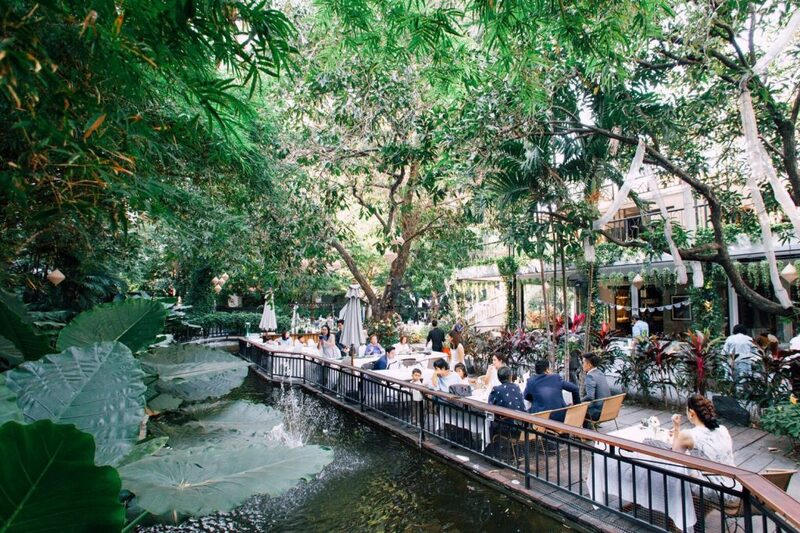 It is a rare find to see any type of lush garden in central Bangkok, but this restaurant somehow found a way to make diners feel as though they have left the busy city behind entirely and headed somewhere a bit more rural. The restaurant first opened its doors in December 2011 and has been pleasing diners ever since with its large, outdoor terrace and delicious Thai recipes, made under the careful watch of Chef Ian Kittichai. 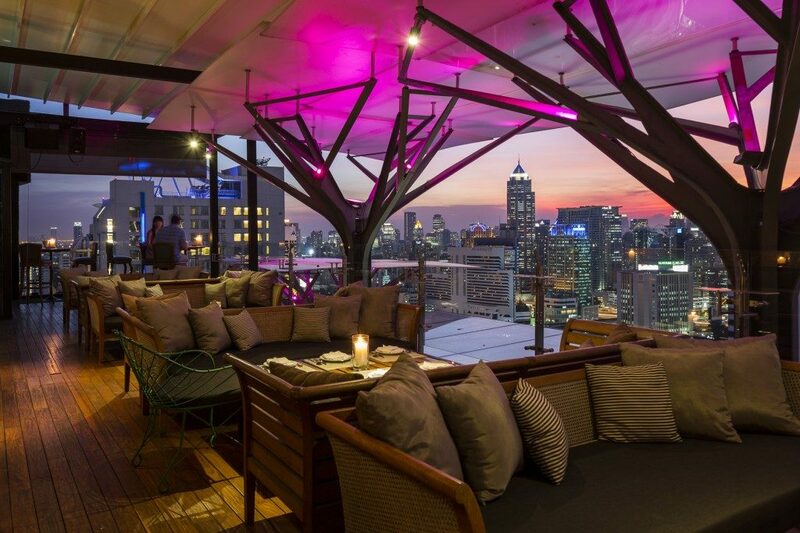 Views do not get much better than those found at Vertigo & Moon Bar at the Banyan Tree Bangkok. The restaurant and bar duo open at 6 p.m., and it is the perfect time to make the journey up the 61 floors to see the spectacular views of the city found at their al fresco rooftop. Grab a signature cocktail and watch the sun set or instead opt for the four or five-course dinner available.